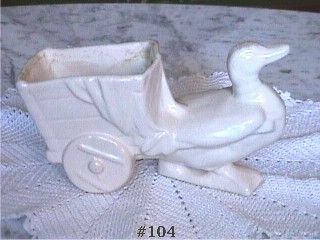 Made in the 1940's, this is McCoy's goose with cart planter. It is in a beautiful white color and is in great condition -- no chips, no cracks. 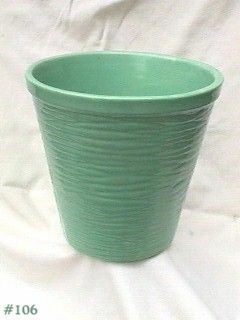 Planter does have normal age crazing and small amount of scaling due to having actually having been used as a planter -- neither are detrimental. 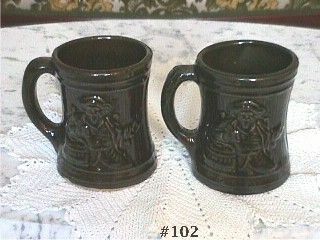 This listing has a set of 2 Buccaneer mugs by McCoy! Made in 1926, these mugs are stoneware green color and are in excellent condition. They have no chips, no dings, no cracks -- difficult to find in this excellent condition! McCoy hanging (or free standing) planter from the Green Thumb Line of 1975! 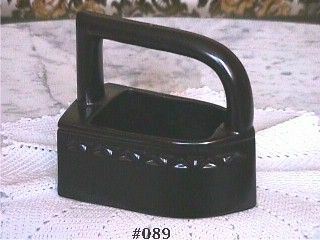 Shaped like an iron, it's in a very pretty metallic black color and is in excellent -- like new -- condition. Planter is marked on bottom: 746, McCoy, Lancaster Colony (mark), USA. Made in 1956, this McCoy jardiniere is in a beautiful pastel green color! It measures 8" tall, 8 1/2" diameter at top. Jard is in excellent condition -- no chips, no cracks, no crazing -- it looks new and unused! This listing has a McCoy pitcher and bowl setmade in 1974! 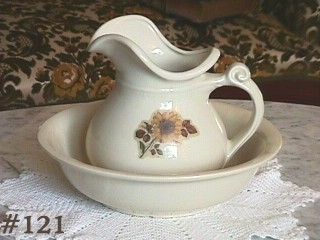 Set is a creamy/off-white color and the pitcher has a pretty sunflower decal. Set looks new and unused and the sunflower decal is intact, no scratches, etc. Beautiful garden dish from McCoy's Lily Bud Line of the 1940's! It is aqua color and has three little "feet". Excellent condition -- no chips, cracks, or crazing. Has 1 small production non-glaze on edge -- not detrimental. Very nice item that is difficult to find. 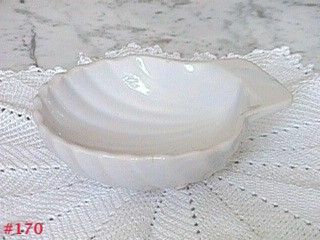 This listing has a McCoy Modern Cope Originals candy dish and is in a shape seldom found -- a large leaf! It has an orange exterior with a yellow interior and is in absolutely mint condition -- no chips, no dings, no cracks, no crazing! Dish looks new and unused with bright vibrant colors! 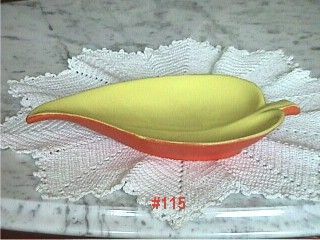 This listing has a very pretty individual size serving dish from McCoy's Islander Line of 1979! Dish is shaped like a half shell and measures 5" long, 5 1/2" wide at widest, and 2" tall. 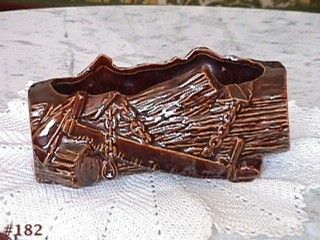 This listing has a very decorative McCoy planter -- it's a log with chains and ax on one side and chains with a 2 man saw on the other! Planter is marked USA on bottom of one end and McCoy on the other end. It measures 6 1/2" long, 3 1/2" wide, and 4 1/4" tall (at tallest). 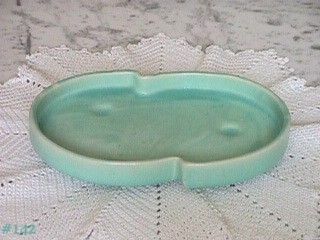 This listing has a McCoy Cope Original candy dish. McCoy catalog lists this as: "Continental Cope Original", 1965, yellow interior with orange exterior. Dish has rich vibrant colors and is in mint condition! 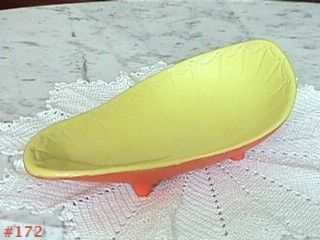 This listing has a McCoy Cope Original candy dish! McCoy catalog lists this as "Continental Cope Original", 1965, Yellow Interior with Orange Exterior". Dish is in mint condition with the exception of a small brown spot in bottom -- it is production, a typical McFlaw and of no consequence. 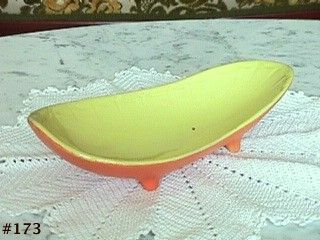 This is a very nice piece of McCoy pottery with bright colors! 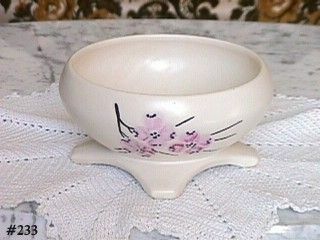 This listing has a McCoy flower bowl from the beautiful Cascade line of 1961! 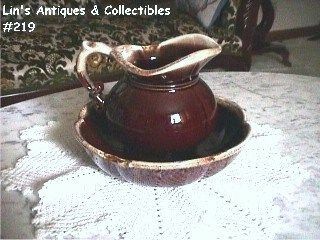 This listing has a McCoy Pottery pitcher and bowl from the brown drip line! 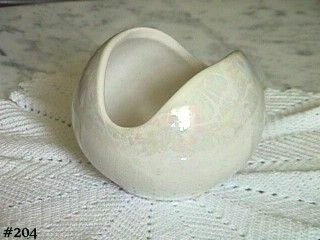 The bowl is 8" diameter and is 2 1/4" tall with softly scalloped edges. The pitcher is 5 1/2" tall with a decorative handle. Both pieces have beautiful color and shiny over-glaze. Marked on bottom: 7528, McCoy, Lancaster Colony (mark), USA. This set is in mint condition -- looks new and unused! 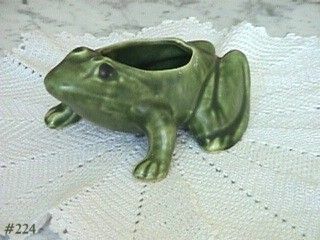 This listing has a beautiful Brush frog planter! He's a pretty frog green color and has black eyes. Frog measures approximately 5 3/4" long and 4 1/2" wide from front foot to front foot and it is in wonderful condition! Has extremely light crazing on bottom, no cracks/hairlines. Has 1 teeny tiny ding (maybe 1/16") on rim at back of planter opening -- that's it! Cute! 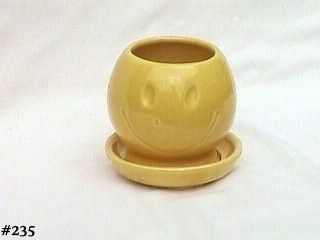 Made in 1971, this is McCoy's 4" Smiley Happy face planter! He's in a beautiful sunny yellow color with a shiny glaze and is in like new condition -- no chips, cracks, or crazing -- no scaling or staining! This is a lovely McCoy planter from the Spring Wood line of 1961! This is the 6 1/2" round shaped planter and is in the beautiful white color with satin glaze and has hand-decorated pink dogwood blossoms. Planter has no evidence of "use" -- it's in excellent condition with no chips or crazing! It has a 1/4" production stress on inside edge -- does not go through to outside and is a typical production McFlaw. This is a very nice planter that appears to have never been used! This listing has a McCoy bellows wall pocket that was made in the mid 1950s! 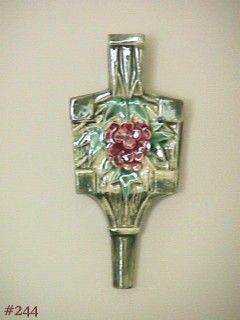 Wall pocket measures 9 1/2" x 4 1/2" and has beautiful colors -- ivory with green accents and red berries. It is in wonderful condition with no chips, no dings, no cracks and has normal crazing (typical on items with this clear over-glaze). 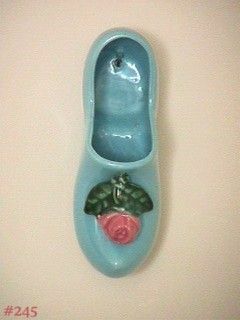 This listing has a McCoy Dutch shoe wall pocket that was made in the late 1940s and is a difficult find!! Wall pocket measures 7" long and bottom is marked McCoy. It's a lovely blue color with shiny over-glaze and has an attached pink flower with green leaves.